Being awaken at 4am by an alarm is rude on most days. Meeting your photo tour guide on the streets of the French Quarter in New Orleans at 5am takes it to a whole other level! The main entrance to our Bourbon Street hotel is closed to vehicle traffic virtually from dusk to dawn, and so I had to meet my guide at the side entrance to the hotel. As I exited the safety of the hotel lobby, I entered a garbage strewn world where the daily trash pick up was about to take place, and where a passed out drunk lay in the alcove to the hotel’s side entrance. The minutes felt like hours, and so I was thrilled when Josh called to confirm that he was waiting for me on the next street corner. I normally make all of my own travel arrangements, and am largely a self-taught photographer. This would be my first photo tour ever. Driving to a remote location in the dark with a complete stranger can be awkward to say the least, and so we found ourselves striking up conversations around photo subject preferences, and favourite destinations. I soon learned that we would rendez-vous with another photographer at a pre-arranged location who would then follow us to our departure point. We parked on the shoulder of Old U.S. 51, about 4 ½ miles from Interstate 10. It took a few moments to adjust to the total darkness, and I enjoyed re-acquainting myself with familiar constellations — locating Orion helped to ground me in what was otherwise a foreign landscape. It also took a while before I realized that there was even water nearby. The crisp nighttime air and light fog felt refreshing, and I quickly forgot about the environment I left behind near Bourbon Street. Flashlights facilitated first introductions where I met Larry, the other guest on this outing who was from Los Angeles, and Norm, the captain of our shallow boat who was waiting for us in the dark on the opposite side of the road. Josh, who is the owner of Wild Louisiana Tours, had let me know earlier in the week that while this outing is normally done aboard a kayak, he wanted to test out the advantages of being on a motorized craft. I agreed to be a guinea pig for this trip. The boat was a small craft. Norm assumed a standing position near the steering handle while Josh and Larry sat on the only permanent bench. I sat on a cooler at the front that doubled as a dry storage box for some of our photo gear. The boat’s shallow design, and long-tail propeller shaft, ensured that we could navigate most if not all of the channels in the swamp. We quickly set off into the Maurepas Swamp Wildlife Management Area. It wasn’t before long that I realized that I was slightly under dressed for this pre-dawn departure. With only a light shell and fleece jacket to fend off the cooling effect of the fog, and wind from being propelled forward, I was soon missing my heavier jacket for this trip (which I had left behind in the hotel room). Our craft safely navigated some very narrow channels, and we were warned to protect our faces from some of the tough grasses that would be whipping us from time to time. 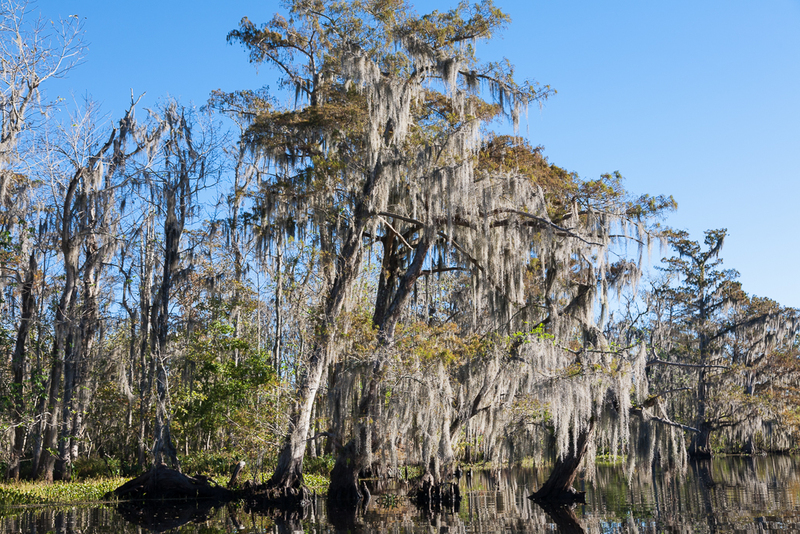 The swamp channels eventually opened up to Lake Maurepas, and we arrived there early enough to check out the different stands of Bald Cypress trees, as well as determine how we wanted to be positioned vis-à-vis the rising sun. Josh and Norm’s knowledge of the area were evident, and they shared some of their favourite spots with us to shoot. Never feeling rushed, we moved from one photographic subject to the next, until we all agreed that it was nearing the time to start heading back. Our return retraced the route taken to get to the lake, and daylight conditions allowed us to see what we had missed on the way there. 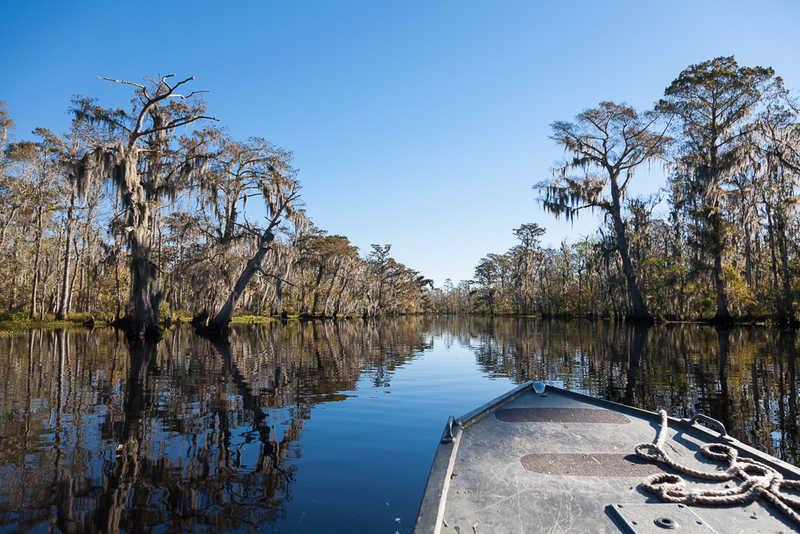 In addition to pulling into some side channels to see some particularly beautiful Cypress stands, all of which were draped with Spanish Moss, we also had the opportunity to see a snowy egret and young alligator in their natural settings. There are always trade-offs in life. Our boat allowed us to see more of the swamp that day, offered us a relatively stable platform to shoot from, and more protection for our camera equipment without needing a dry bag, but a kayak would have likely allowed us to get closer to the wildlife without having the outboard engine spook them. If I ever get out this way again, I would definitely try the kayak the next time around to experience the difference for myself, and would gladly do so with Wild Louisiana Tours.